WELCOME BACK AN ON BOARD FROM MAY 1- 2019! Embark on an unforgettable day along the unique coastline of Bornholm. Fill your lunges with the fresh Sea-breeze, feel the sun and the salt water on your skin and all your senses stimulated by the elements of nature. We offer three daily coast trips from Gudhjem habour. Two daytrips and one sunset tour. The daytrips including a serving are 2 hour scenic cruises departing from Gudhjem at 11:00 and 13:30. The captain will be telling you about the sights and interesting landmarks we pass along our way. The price includes a light serving and a glass of lokal beer or homemade lemonade during the trip. 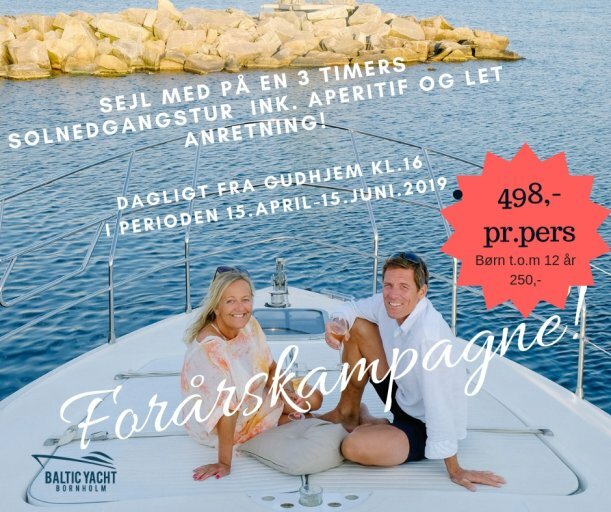 The 5 hour sunset cruise including a 6 dishes tapas menu starts at 16:00 and brings us back to Gudhjem around 21:00. Along the way the captain will be telling you about the sights and historical facts. After having seen the highligt of the trip, the castle ruin from the water side, we will port in the idyllic Hammer habour where you will have a chance to debark or just stay on the yacht and enjoy the wonderful view along with your meal and lovely drinks to go with it. An aperitif, snacks and tapas menu are included on this trip.